Get rid of anything you don’t wear anymore. That’s easier said than done, so what you should do is hang up your clothes with all the hangers facing one direction. Every time you wear something and it gets washed, hang it up with the hanger facing the opposite direction. Within a year, get rid of the clothes with their hangers facing the original way. For clothes worn for certain seasons, place it in a plastic bag that can be vacuum sealed to it conserves space in your wardrobe. Tension rods are your best friend. It can be used to hang up scarves and purses. It can also be used to hang up boots so they retain their shape. Use hangers with clips to hold on to your boots and hang them up on the tension rod. Use your closet door to hang up accessories like earrings, bracelets and necklaces. For earrings, use a small screen so you can easily see them. Hooks work for bracelets and necklaces. It’s also useful to have a mirror on your closet door. Keep your makeup brushes, pencils, mascara and other long cylindrical items in tin cans or pencil holders. 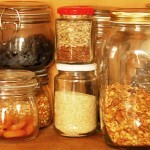 Smaller items can be kept in bowls or shallow dishes. Also, if your makeup is past the expiry date, get real and toss it out. Use a magnetic board and little magnetic strips on the back of your makeup so you can easily see them without having to go through drawers of clutter. A pullout box beneath the bed can work as a shoe organizer or a bag organizer. It can basically hold anything you don’t use very often. If you have hair ties everywhere, you can glue a bottle or anything tall and cylindrical to a shelf or on your table and it will hold your hair ties and/or bracelets. Carabiner keyrings can also keep your hair ties in check if you don’t want to glue anything to your desk. Clamps can be used to hold wires and chargers. Just put the cord through the handle and clamp it onto the side of your desk so the wires don’t fall to the floor when they’re not in use. Put a cloth caddy by your bed to hold your phone and/or a book so it doesn’t just end up on the bed. If you’re always losing the remote, attach some Velcro onto the backs of remotes and onto your tables. If you hate Velcro, a small remote caddy on the side of the couch works as well. Near the entrance to your home, place a dish where you can place your keys. In the same area, you can also place a message center for storing mail, bills, and other important papers. An ottoman that doubles as a storage box is great for keeping all sorts of items. A piece of plywood and an assortment of knobs and hooks can turn into a nice little hook hanger for umbrellas, keys, scarves and hats. Place a bench in the entryway and store your boots and shoes underneath it. This also helps keep your home clean. Put magazines in boxes beneath your coffee table when you can easily reach them when needed. Glue a magnetic strip to the inside of the door of your medicine cabinet so you can store bobby pins and light metal items like nail files, tweezers and other manicure tools. For the rest of the space, put tiny compartments in there to hold little things like ear buds, nail polish, toothbrushes or makeup. Put mini storage bins or spice racks on the door or wall for added storage space for extra toothbrushes, soaps, or toilet paper. Use two curtain rods in your shower or bathtub so you can hang up caddies for shampoos, conditioner and bath gel. Add a shelf above the door for ever more storage. And if you think you have too many towels for such a small space, roll them up instead of folding. Put magnetic strips on the bottom of little spice jars and stick them onto the fridge. You can also do this with tea tins where you can place recipe cards, shopping list papers and pens. Put a rotating tray in your fridge so you can just spin it to get to the stuff at the back. Invest in hanging storage for your pots and pans. But make sure your kitchen ceiling is high enough! Use a magazine organizer to store the lids of your Tupperware or pots. You can also use two stick-on hooks to hold them. Put tension rods in cupboards so you can hang up spray cleaners. Put little hooks inside the cupboard so you can hang up measuring cups. Adding a conversion chart in there helps, too. Store your cleaning materials in a caddy and hang them up behind the door for easier access. Don’t forget the overhead space. Install a shelf up there for storing boxes. Hang up a magnetic strip in your garage. Get cheap little plastic containers and put small magnets at the bottom. Use these to store small things like washers, screws and nails. Storage bins of all shapes and sizes can be hung up on walls and pegboards so you can easily see your tools and other stuff. 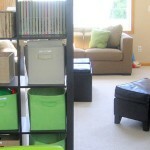 Many storage locations in your home can be refurbished and repurposed. Using these techniques will help you keep track of where everything is, and more importantly it will keep your home nice and tidy. It may even be worthy of a magazine shot!